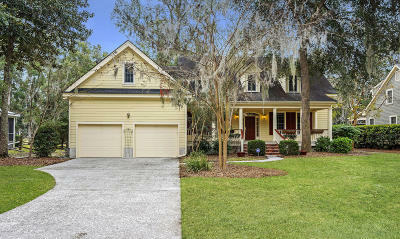 Welcome Home to Lowcountry Living on Cat Island! This spacious home is ideal for a multi-generational family with in-laws or a growing family. The Master Bedroom with a large bathroom, jetted tub, separate tile shower and large walk-in closet is on the main floor and secondary bedroom with a full bathroom is on the other side of the house. The main floor also offers wood floors, a welcoming foyer, large living room with cathedral ceilings, a gas fireplace, formal dining room, office with glass french doors and a laundry room with utility sink. The kitchen has a large walk-in pantry, double oven, gas range and breakfast nook. Upstairs offers a HUGE open bonus room, a 2nd HUGE BONUS ROOM with a door (can easily be converted into a bedroom) and a true bedroom with full bath and attics.